Disclosure: I will receive payment if you purchase make a purchase after clicking certain links. Also, I received a free item, but it in n away influenced my opinion. All my daughter wanted for her birthday this year was to get a unicorn. Luckily for me, I didn’t have to buy a real pony and put a horn-shaped hat on its head. Instead, I got my daughter exactly what she wanted, a set of three unicorn puppets. With bright, vivid coloring and mouths that move, the puppets became a playtime favorite. Playing with the toys, I discovered how neat the puppets’ appealing color and design were. Earlier this year, I reviewed another set of Puppet on a Stick products, The Sea Squad. Recently, I had the old puppets out for my daughter’s fifth birthday party. All of the boy guests there were immediately drawn to the items: a shark, a clam, an octopus and a fish, which fit well with the under the sea theme of the party. While the Sea Squad set appealed to boys and girls, the items were also educational. Because the items were so much fun, I was eager to see how my daughter enjoyed the Rainbow Prancer puppet set. One of the nicest things about the items were their fun colors. Each unicorn had a different colored face and a different colored horn. 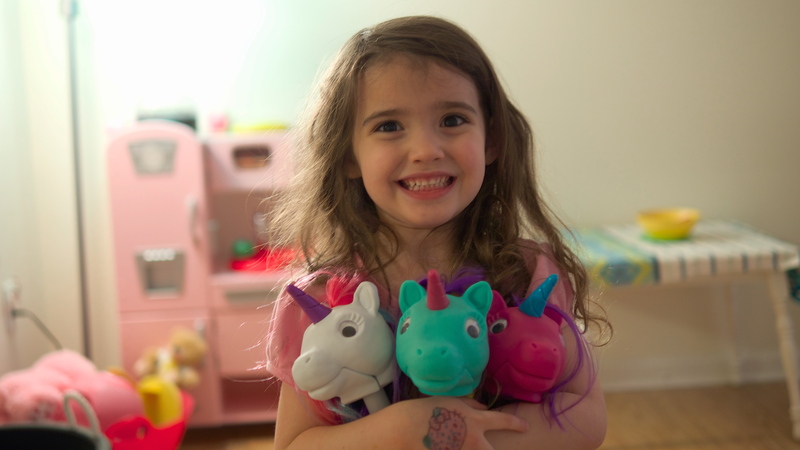 I received a pink unicorn with a blue horn, a white unicorn with a purple horn and a green unicorn with a pink horn. Each unicorn had fun, bright hair with stripes of different colors. Since my daughter is a very visual girl, she loved the look of the items. Another neat thing about the puppets was their design. Each puppet had long, flowing hair that caught the attention of both of my daughters. The puppets’ eyes moved, which made them look even more lively. Opening the puppet’s mouth with the working jaw revealed the unicorn’s tongue, so the kids could easily create dialog while playing with the puppets. Even my younger daughter had an easy time opening and closing the puppets’ mouths. All the items were easy to use and they helped create many fun, playful opportunities for my children. My kids really enjoyed playing with the unicorn puppets. In the future, I will look forward to playing the third puppet as my daughters play with the other two. The trio is the perfect size for my family with one puppet for mom and one for each child. Looking for more reasons to shop for Educational Insights toys? You can get free shipping on all orders over $50 without using a promo code. For more children’s products, check out Toys. You can also follow Theresa’s Reviews on Facebook, Twitter, Pinterest, Instagram, Flipboard and Youtube.